Balmain Bugs are members of the family Scyllaridae and are characterised by their broad, flat shaped bodies and large carapace. The species also possesses broad but short, flattened antennae and five pairs of legs. 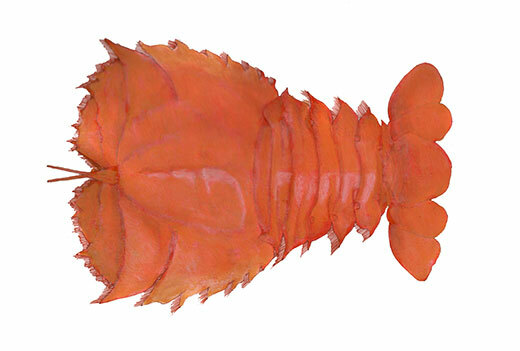 The Balmain Bug is reddish in colour and its flat shape enables it to partly bury itself in exposed soft sediments. They feed on small crustacea and algae and are active at night. Balmain Bugs can reach a total length of over 25 cm and a weight of around 400 g.
Balmain Bugs, also known as slipper lobsters and shovelnose lobsters, are distributed throughout the southern half of Australia from Queensland to Western Australia. They inhabit soft sand and muddy environments in water depths ranging from 15 to 650 m, but found most commonly at depths of 150 m.
They are sometimes confused with the Moreton Bay Bug (Thenus orientalis), however this bug is more elongate than the Balmain Bug and its eyes are at the carapace margin rather than the carapace midline as seen in the Balmain Bug.